HASSAN FATHY, an Egyptian architect, has taught on the Faculty of Fine Arts in Cairo and served as head of its architectural section. He has received the Union of International Architects Gold Medal, the Egyptian Government's National Prize for Arts and Letters, and the Aga Kahn Award for Architecture. He is the author of Architecture for the Poor, also published by the University of Chicago Press. The author and the United Nations University would like to thank Dr. Abd-el-rahman Ahmed Sultan for kindly allowing the reproduction of his copyrighted photographs appearing as figures 21, 22, 24, 25, 26, 27, 28, 29, 30, and 72 as well as for the preparation of all the drawings used in the text with the exception of figures 51 and 79. The unit used on the scales of all drawings is the meter. 1. Architecture, Domestic-Arid regions Arab countries. 2. 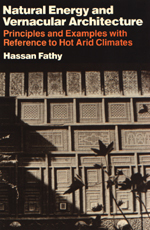 Vernacular architecture-Environmental aspects-Arab countries. 3. Architecture and energy conservation-Arab countries.